When inline skates wheels, there are some points that need to be considered before purchasing. First, there is the number of different numbers on a wheel. The roll hardness is measured on a role as in "82a". Make sure that your purchases of roles always that you have a hardness of about 80 a. All roles are outdoor roller 80a. The higher the number, the harder the role. Likewise, the smaller the number is, the softer the role. Only if you want to drive to a gym or similar soft ground, would be recommended under rollers 80a. Buy the inline wheels can be very simple. To ensure that your purchase is not a disaster, we have. Wheels in our shop also on wheel size, a few helpful lines for you In the wheel size, there are many choices. However, not every role fits in any skate. On most inline skates on the rail is the maximum size of the wheels out. What size of wheels can be installed on up to this skate Smaller roles, but you can always install. Now you can find your perfect role in our wheels shop. The larger size of the reel is, the faster the speed, the more easily you roll over road bumps or stones. You need to push less. The speed and the ride is enhanced. The larger size of the reel is, the harder it is of course the skates safely to control the curves. The Inline can be directed not so easy. The topic - Brakes are often underestimated. The stopping distance and the wear of the brake stopper in the beginning. Which wheels I should buy? purchasing wheels at the speedskating area. There is only one correct answer. The company Matter is produces successfully inline skates wheels for many year. Matter wheels - produces high quality Speedskating wheels. If you want to buy your speedskating wheels for your speed skates in our shop, then please buy the matter wheels. We sell successfully since many years K2 wheels, rollerblade wheels, Powerslide wheels and Matter wheels. Start shopping now in our wheels shop. 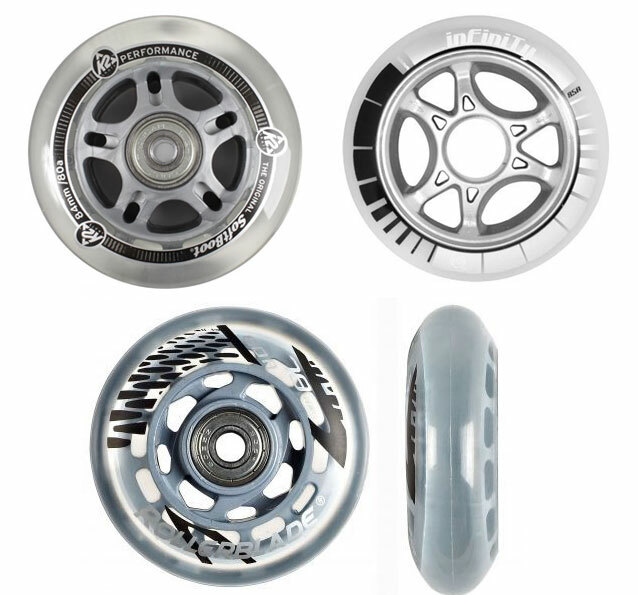 Whether you're looking for wheels for your leisure skate or your speed skate - we have it all in our wheels shop. Our Customer Service will help you with expert background. Your wheels shop for all kind of inline skate wheels.